Ten WCSRT temperature loggers were deployed in 2015 on the Itchen below Twyford in collaboration with fisheries and riparian owners. The daily pattern of warming/cooling at each site on hot days has been examined aiming to check for anomalies in the natural downstream sequence of rising river temperature. Potential influences include: slow-flowing diversion channels, groundwater upwelling, reaches with extensive treeshading, water abstraction at Otterbourne and treated sewage discharge at Chickenhall. Further details of the project and its collaborators can be found here. 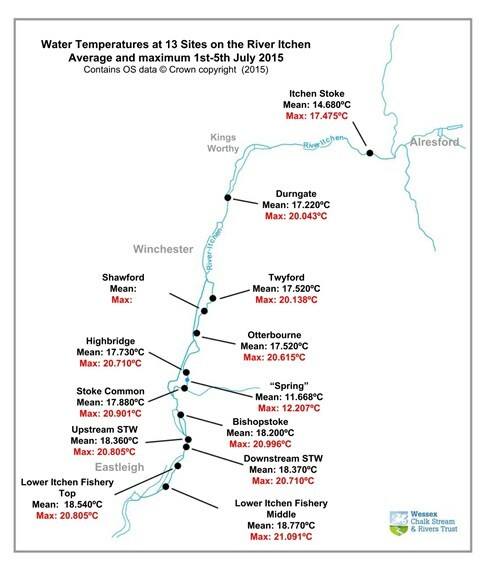 A viewable map here shows the average and maximum river temperatures recorded by WCSRT Itchen loggers over a short period (1-5 July 2015) when England experienced its record air temperature of 36.5°C at Heathrow. * 2011 Woodside carrier: logger recovered after being dredged out during channel maintenance in mid-August. * 2011 Kimbridge carrier: logger display indicating period of air-exposure in August. * 2011 Kimbridge main river: logger was unshaded for a time then re-located after a tree fell in the river. ^ 2013 Allen Wimborne: logger partly exposed to air from mid-July. Bickerley carrier: Jan-Mar 2013 values also available. ^ 2013 Test Fullerton: logger exposed to air 10 Aug - 7 Sept.
^ 2013 Itchen Twyford: a few sharp daily temperature peaks from mid-August on warm days - very small influence on monthly mean. ** 2014 Bickerley carrier: change in logger location, moved 200m d/str, logger burial by silt greatly reduced max/min temperature range after July. ** 2014 Test Fullerton: logger exposed to air after mid-June. ** 2014 Itchen Durngate: some large daily temperature changes in June/July suggests extended periods with air-exposure of logger - possibly d/str sluice opened? ² 2015 Avon Bickerley carrier: logger missing on retrieval. ² 2015 Avon Ibsley: logger exposed to air temperatures for periods when river level was low adjacent to weir. ² 2015Test Leckford: logger missing on retrieval. ² 2015 Itchen Upper Waterworks top: logger lost in post. *Avon Bickerley carrier: logging discontinued after 2015. Avon Ibsley: logger exposed to air temperatures for periods when river level was low adjacent to weir. Test Leckford: logger failed to start so no records for 2016. Itchen Breach Copse Spring: recording not repeated in 2016. Itchen Upper Waterworks top: 2015 & 2016 data added after logger re-found. 2018 Itchen Durngate: logger missing. 2018 Avon Ibsley: logger exposed to air temperatures after June. 2018 Itchen Bishopstoke & Test Leckford: loggers discontinued after loss in 2017. 2018 Itchen downstream on Lower Waterworks: logger awaiting recovery.